Nong Youhui, a young boy living in southern China, has bright blue eyes that glow in the dark, and give him enhanced ability to see in the dark. Now the video. Ling [the boy's father] said: "They told me he would grow out of it and that his eyes would stop glowing and turn black like most Chinese people but they never did." If you're one of my usual attentive readers, you're as skeptical of this story as I am. But, it's hard to resist, particularly for fans of sf films like Pitch Black and The Chronicles of Riddick. 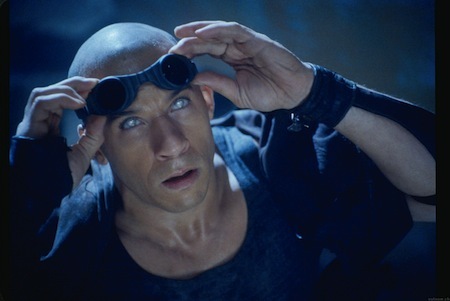 In the film, Richard B. Riddick (played by Vin Diesel) has "eyeshine" - he as bright blue eyes that he can use to see in the dark. Depending on which version of the story you like, Riddick had his eyes operated on while incarcerated in an underground prison to give himself an advantage over other prisoners. I've been fascinated with the vision of nocturnal animals since childhood, and read eagerly about the tapetum, an eye structure that humans do not have. The tapetum is a really clever idea (kudos to Nature personified, or to the evolutionary process); it is a layer of reflective cells behind the eye that reflect any incident light back through the layer of receptive cells, thus doubling the chance that the light photons would be absorbed and thus available to the vision system of the animal. So, if this is a real story, my congratulations to Nong Youhui, the next step in human evolution. Via Presurfer; thanks to the always-patient Moira, who contributed the tip and the reference on this item sometime last week.